The United States is once again sending aid to Afghanistan. The country received billions in assistance during the 1980s as a front in the Cold War, only to have it recede after the Soviet Union withdrew. The country was devastated by the war, and in the absence of a sustained development program from the United States, the country descended into a failed state, making it vulnerable to extremism in the forms of Al Qaeda and the Taliban. Afghanistan is now a major front in the war on terrorist networks. Aid has returned with the new conflict, but it is mostly in the form of military assistance. The United States’ commitment to development and reconstruction in Afghanistan has been detoured by the war in Iraq. A new sustainable security strategy is needed that focuses on rebuilding the country and helping the Afghan population lift themselves out of poverty. $36 billion: Amount the United States is spending on military action in Afghanistan annually. $10.4 billion: Amount of aid the United States pledged for development in Afghanistan from 2002 to 2008. The United States provides a third of all development aid to Afghanistan. $5 billion: Amount of aid the United States has actually dispersed. $50 billion: The amount the Afghan government has requested from international donors to be used over the next five years for development. Over 2 million: Number of Afghans who do not have regular supplies of food. 70 percent: Percentage of Afghanistan’s population that is illiterate. 50 percent: Percentage of Afghanistan’s population that lives in absolute poverty. 40 percent: Percentage of Afghanistan’s population that is unemployed. 90 percent: The percentage of the Afghan government’s spending that is funded by foreign assistance. The lack of private sector investment combined with the growing narcotics industry leaves the government with a weak tax base. The conflicts in Afghanistan over the past 30 years have caused major damage to the country’s infrastructure. A starting point for development assistance should therefore be to focus on repairing roads, which would provide citizens with better access to markets. This step would also link rural villages to the rest of the country and integrate villagers into the country’s economy. 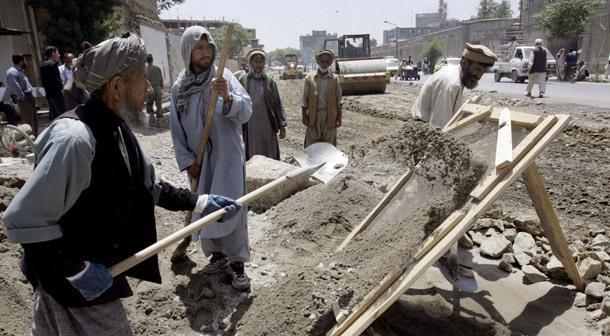 Increasing aid to the National Solidarity Program’s Afghanistan Reconstruction Trust Fund, which manages rural infrastructure and reconstruction projects at the community level, would be a way to do this. The current U.S. counternarcotics strategy should be combined with a development strategy based on the Afghanistan National Development Strategy released earlier this year by the Afghan government. The strategy lays out the government’s goals for economic growth, governance, and security. The United States should also disperse the full amount of aid it has promised. Taken together, these steps could put the United States on a track to stabilizing the country and preventing the further spread of extremism in a critical region.